Happy Wednesday! Wednesdays here on Prefer 2B Demure means it's time for me to gush about a product, brand, and or style of clothing I'm totally gaga for! Some of my favorite pieces are from Retrolicious/Folter so I decided to share my love affair with this brand! 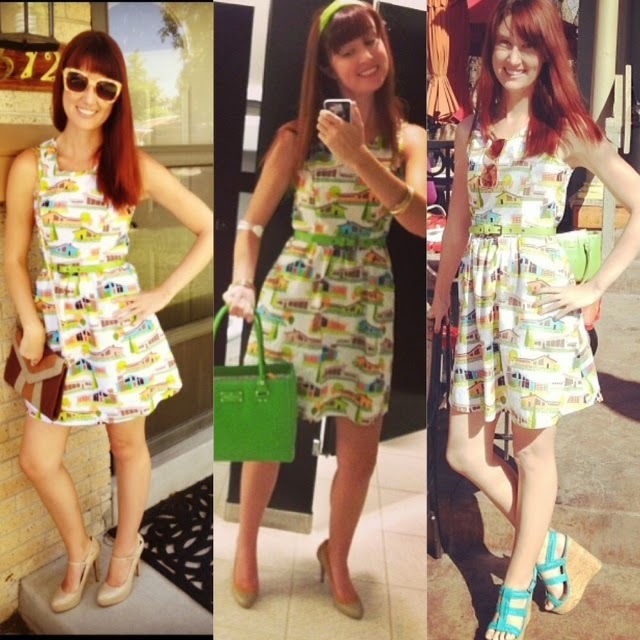 I was introduced to the brand via Modcloth and I think they have some of the most fun novelty prints out there. What's nice about this brand too is that it is vintage inspired, but a lot of the dresses are shorter lengths too (good for summer) so it's a nice balance for being loud but not too over the top in terms of being "costume-y" or stuck in any particular decade...which I find to be more versatile. The the first piece I ever got from them, as well as my first Modcloth purchase ever(! ), was this cassette tape skirt. As I've mentioned a few times before, in 2012/2013 I was starting to look to branch out fashion wise and do some more classic/demure looks but also keep it fun. I had been trolling the Modcloth website a bit at this point but wasn't in love with a piece enough to get anything just yet. Then I found the cassette tape skirt! It's obviously very fun, especially for a longer length skirt, but the real reason I fell in love with it is because it reminds me of my favorite book, Love is a Mixed Tape by Rob Sheffield. I'm typically a "serious" or "academic" non-fiction reader only, but this memoir about one of my favorite music journalist's relationship and marriage with his wife and how he coped with her sudden death simultaneously broke my heart and inspired me all at once for what I was looking for romantically (hopefully without the sudden death part...!) when I read it in 2010. He never once glamorizes their love or marriage but is always nothing short of endearing when writing about his late wife. Their biggest connection and start to their union was through their love affair with music and how they related to it, and given that music is a big part of my life this book spoke to me in a huge way. It's become something of my "due north" while navigating my own romantic life in that when I had to make a tough decision to break it off with a boyfriend last year but was feeling timid about pulling that trigger, I skimmed through most of Love is a Mixed Tape book one evening to realign my priorities in what I was looking for so that I didn't waste more time with someone I shouldn't be with. Looking back, I'm glad I did that because it gave me the strength to move forward with the breakup and in retrospect-no offense to my ex- our connection was lacking in more ways than one so re-reading it was a needed reality check. Given how much this book has impacted me emotionally, it was impossible to not get the skirt that looked like the cover of the book. 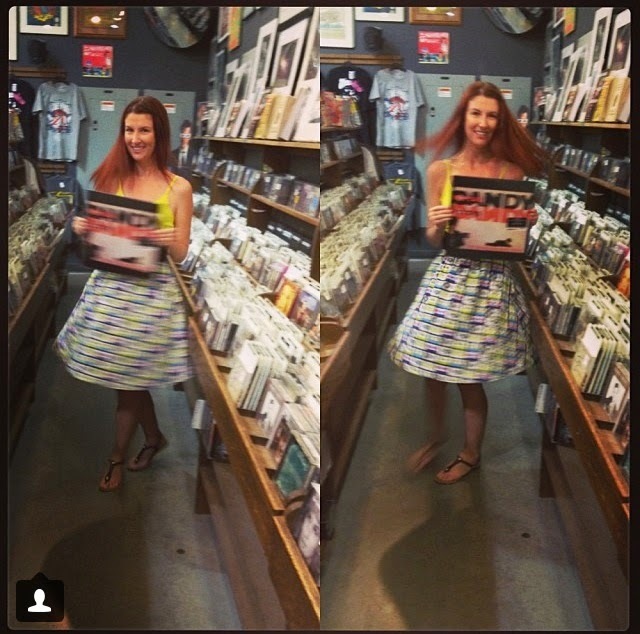 During this spring's "Modtwirl" contest I even picked this skirt for one of my entries, in one of my favorite places (a record store), holding one of my favorite albums (Jesus and Mary Chain's Psycho Candy). I fell in love with another one of Retrolicious' prints due to another favorite pop culture reference, and that print is the Brady Bunch house dress! Initially, because the houses are kind of big, I wasn't sure it would be flattering so I wasn't foaming at the mouth for it. But then in Modcloth's Style Gallery and on Instagram I kept seeing this dress pop up and fell in love. The only remotely negative thing I have to say about Retrolicious is that I always have to wash the clothes to shrink them a tad before I can wear them. Their sizes are S-XL and while several brands fit me just fine in a small whether that's their smallest size or they also carry smaller sizes, more often than not I'm a XS. What I'm trying to say that if you have similar measurements as me, the small feels more like between a medium and a small. But because their items are all cotton they are shrinkable and fit basically perfectly from there. I imagine other sizes may be similar, but I'm not totally sure. All in all though, I would recommend this brand to a friend and I'm super happy I stumbled across Retrolicious! I love the Folter/Retrolicious brand! I also found them through ModCloth. I love that they have so many unique novelty prints and like you said- they're vintage inspired but not too "costume-y". The few pieces I have I haven't shared on my blog just yet but I can't wait until I do. You look so cute in all these pictures, as always. Even when you were getting your blood drawn! I love how positive and full-of-life you are <3. Also now I'm inspired to read the mixed tape book, it sounds inspiring! I know you mentioned you are typically a non-fiction reader but another really good book I recently read that touched my heart is "Archer's Voice" - I highly recommend it. I usually gravitate towards mystery/suspense/legal case-type books myself so those sappy romance books aren't really my thing, but it's a different type of love story - not too cheesy or underdeveloped character-wise like most sappy love stories are! Oh man! I can't wait to see the ones you have!! Thank-you for the compliments- I'll be damned if I "look sick" lol. I'll definitely check out that book! Gotta love those different type of love stories! Retrolicious is sooooo you! Haha, we have the opposite problems regarding fits/chest areas! You're so lucky you're mom is good at that stuff!! I love Folter/Retrolicious! My favorite piece is my wiener dog houndstooth dress. They really have the cutest novelty prints! Thank-you, darling! I love that dress as well! Thank-you for stopping by, gorgeous!